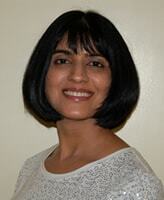 Dr. Chaudhari has been a resident and practicing dentist in Westchester since 1999. She graduated from Tufts University School of Dental Medicine in 1998 with a DMD degree. She was also an instructor in Restorative and Prosthodontics Sciences at NYU Dental School. She is proficient in all aspects of general dentistry as well as cosmetic dentistry and is certified in Invisalign. In her free time, she enjoys painting and sculpting.